We continued some space themed activities this week, looking at the moon. I think this will be our last week, and we will move onto something else next week. To kick off our work on the moon, I printed a little phases of the moon book. We talked about the activity we did a couple of weeks agoI fo, rolling a marble around a lump of playdough to represent the earth moving around the sun, and how the moon goes around the earth in the same way. I found this booklet at Free Homeschool Deals. Munchkin liked writing her name on the front. I also printed the Phases of the Moon book from Teachers Pay Teachers. I thought Munchkin might like to colour the pictures. I am convinced that she is actually able to read quite a bit, so providing little readers might be useful. She won’t read to me if I ask her to, but she will often indicate that she can read anything from road signs to food packets. She and I often write letters to each other, and sometimes I can catch her out, and she will ask me why I wrote something before she asks me to read her letter to her! You know, I probably saw this activity on Pinterest at least a year ago, and I thought to myself that I would never to that – too many cookies! Fast Forward a year…and, of course, we did! She didn’t eat all the cookies herself though! I mean it’s great – how engaging to be learning with yummy snacks! I used these moon 3-part cards. We laid out the control cards in sequence and made our cookie moons. We took turns matching the labels to the cookie moons, and munching on the cookies! I found this activity at pre-k pages. We looked at a big picture of the moon, and talked about the light and dark patches. Last week, we had some discussion about the planet Uranus being hit by an object and tipping on it’s size. I told Munchkin smaller objects hit our moon, and made dents and craters. Then, I put a layer of flour in a plastic tub, and added a layer of cinnamon on top. Munchkin had different sized marbles to drop in, and we got to see craters beings made. I saw this activity at Every Star Is Different. I used printable planet cards from 123homeschoolforme, and simply wrote the number of moons each planet has on the bottom of the card. I provided a lot of glass rocks and we had a chuckle about how many moons Jupiter and Saturn have. Munchkin did Earth and Mars by herself, and we did Uranus and Neptune together. I found the plans for this moon phase box here (also, I’ve been to Jodrell Bank!) and put it together the other evening. It worked fairly well, but was hard to keep the box still. I used a wooden bead for the moon, and it swung about a lot and was possibly a bit too small. Still, we could see the phases of the moon with the box. Both my girls played with the box and had fun peeking through all the little doors. We didn’t get too much art in this week. I did find a fun moon craft at Sorting Sprinkles. Munchkin mixed some of the flour from the crater tray into white tempera paint, and shook in some glitter too. I drew a circle around her paint dish, and she painted away. She then wanted to fold the paper in half. I folded another paper in half for her, and drew half a butterfly for her to fill in. She folded the paper in half to paint the other side of the butterfly. On a couple of different days this week, Munchkin has wanted to write letters, and has had me dictating to her which letters she should be writing. She and I talked about a moveable alphabet, and have had some foam magnetic letters out this week. One evening, I re-purposed a fishing tackle box to make a quick, cheap moveable alphabet. I have a 1″ square hole punch, so I created a file to fit. I printed 5 copies of each page, and sorted each letter into it’s own compartment. My tackle box only has 24 compartments, so for now, y and z are stored in their own Ziploc bags. If she really gets into using it, I will look at purchasing a proper, wooden moveable alphabet for her. You can download the pdf I created here. That’s our week! Thanks for reading. What a fun unit! 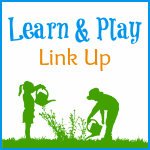 Thank you for stopping by the Learn & Play Like Up! This post is featured on Christian Montessori Network this week.